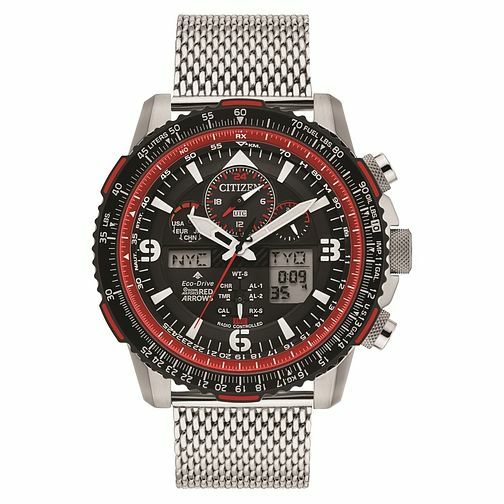 The Red Arrow limited edition men's watch by Citizen showcases precision in every aspect. A bold black dial depicts atomic timekeeping from 43 cities, packed with features of chronograph, perpetual calendar, dual time, a countdown timer, alarms and digital backlight display to easily read in the dark, this timepiece has it all within a strong stainless steel casing and co-ordinating bracelet. Eco-drive technology allows this watch to function without the need of a battery, ideal for a man constantly on the go! This limited edition timepiece comes in a special presentation box to commemorate, making for the ideal gift for a loved one or for treating yourself to.